During my recent trip to Cape Ann, I went into Boston with my family on four days: a day trip, an evening at Fenway Park, and a day-and-a-half at the end of our stay. The weather ranged from cool and incredibly rainy on the day trip, to warm and sunny at the baseball game, to extremely hot on our penultimate day and hot, humid and sometimes rainy on our last day. Ah, New England summers! I've already written about some of the new or new-to-me coffee shops, including Broadsheet Coffee in Cambridge, Gracenote Coffee in the Leather District and George Howell's Boston Public Market location. I've also updated my Boston and Cambridge speciality coffee guide and map, originally published in February after my first trip to Massachusetts of the year. This post will cover the other things I did while in the Boston area — mainly shopping and eating, of course — which I've organised by neighbourhood. On the last night of our holiday, we stayed at the Lenox Hotel on Boylston Street, which was a great location for a flying, 36-hour visit. My room on the 9th floor didn't come with a view but it was very well-appointed with a very comfortable bed and very nice amenities. They have some great itineraries on their website, including a five-mile jogging route along the Charles River, which I followed on my last morning. I was also pleased to find that they had complimentary nitro cold brew coffee from Amherst-based Share Coffee available in the lobby. The Back Bay is a particularly good place to stay if you like to shop, and I spent most of the afternoon of our rainy day trip inside the Prudential and Copley shopping centres. 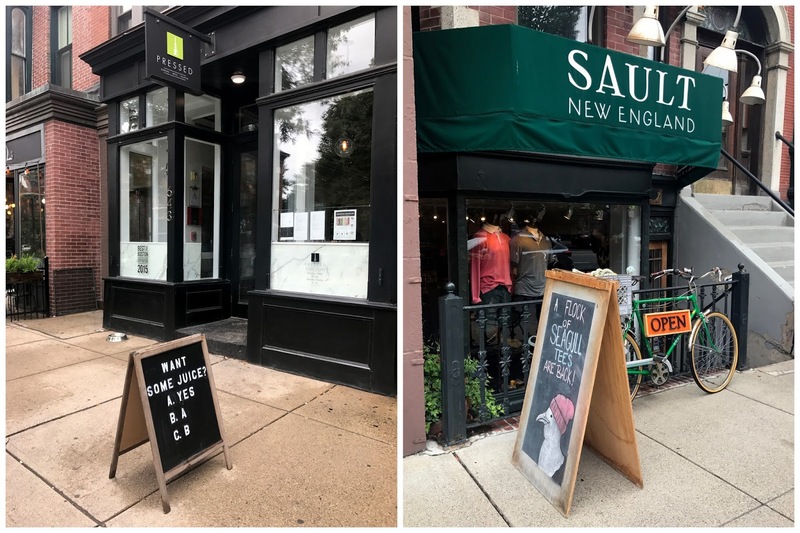 When I returned and the sun was out, I loved strolling down beautiful Newbury Street with its combination of independent stores and mid-range to high-end chains. Sadly, the Ben & Jerry's van had run out of free 'pint slices' by the time I got there but I consoled myself by browsing one of my favourite book stores, Trident Booksellers. There were plenty of nail bars and spas on Newbury Street itself, but based on Yelp advice, I went to Boston's Nails & Spa on Boylston instead. My manicure lasted 11 days and I got to overlook the Boston Marathon Finish Line while my nails dried. We had a late flight back to London on our last day, so had an early supper at Abe & Louie's Steakhouse on Boylston to maximise sleep on the plain. My burger was delicious, the portions were huge and the service was excellent. When the sun came out, I enjoyed strolling across the Boston Common and Public Garden. It was over 30C on my penultimate day, some 30 degrees hotter than when I was there in February. Another new-to-me discovery was Boston Public Market, a fantastic indoor gourmet market selling everything from delicious doughnuts to dinosaur succulent holders. I sampled a couple of doughnuts (both great) and, on a separate occasion, some oysters, and it's a lovely place to browse — especially if the weather is not behaving. We had a late lunch one day at JM Curley, near Boston Common (and George Howell at the Godfrey Hotel), one of those casual-cool all-day restau-bars that the US always does so well. The burgers here are some of the best in the city, although I was also won over by the duck poutine and my very good gin cocktail. We also ate one night at the Park Plaza branch of Boston surf-turf behemoth Legal Seafoods. The food was excellent (the oysters were great, and I had some super tuna sashimi and a lovely pistachio-encrusted salmon) but I didn't drink my cocktail (it was a 'Georgia Julep' but tasted like cheap peach schnapps) and the service was, by turns, slow and somewhat overbearing. I made a stupid mistake when calculating the gratuity — I left 12% instead of the 20% I meant to leave — which resulted in the waitress, after a consultation with a manager, coming back to tell us we "hadn't left enough money". Several further awkward minutes of this soured what was supposed to be a celebratory family dinner. We loved the food but I wouldn't go back to this location, which had lots of big groups of tourists that night and lacked ambiance. I like to call the Boston Red Sox 'my US team' and I have now seen them play three matches at Fenway Park over the past 24 years. It may not sound like much, but several people expressed envy, noting that many baseball fans have watching even one game at Fenway Park on their bucket list. The upshot is, I finally understand the rules of the game (the whole innings thing confused me) and really enjoyed the game against the Kansas City Royals. As we booked so last minute, we didn't have great seats but I could see the gameplay well enough. We ended up leaving three hours in at 10 pm as we had to drive back to Gloucester, but the match went to ten innings and didn't finish until after midnight! FWIW, 'we' won the game 9–8 but lost the series 3–2. I'm told that the high scores in our game are unusual so we were lucky to see so much action. We paid about $80 per ticket — not very cheap (especially when you factor in parking, hot dogs, drinks and so on) but it was a fun night and the atmosphere in the stadium was great. I ended up spending very little time in Cambridge, most of it walking in the rain to and from Broadsheet Coffee. I did manage a very quick amble through Harvard Yard, though, and was surprised to find quite so many people queuing to take their photo with the John Harvard statue even in the pouring rain. While I was doing a coffee workshop, my parents went to the Glass Flowers exhibition at the Harvard Museum of Natural History and recommended it highly. I love walking tours and if I'd had time, I would liked to take one of the alternative Hahvahd tours (now with Zuckerberg and Portman locations), which are supposed to be fun and informative. As I'd walked some of the Freedom Trail earlier in the year, I didn't spend much time in the North End on this trip. I do like to explore in this neighbourhood, though, and before dinner at Antico Forno, I enjoyed browsing the cute clothes and accessories just down Salem Street at Shake the Tree. The Neapolitan-style wood-fired pizza at Antico Forno ('old oven') was very nice, although a little overwhelming as we'd only finished lunch a few hours earlier. We also stopped by Caffè Vittoria, an Italian espresso bar on Hanover Street where I took my first ever 'arty coffee photo' back in 2005. I had to reconstruct the shot, of course, although I had a macchiato rather than a cappuccino and skipped the ice cream. I liked the ambiance and loved looking at the vintage coffee-making kit on display at the back. After a couple of brief forays into the hip South End in February — to Render Coffee one morning and a work event at Cyclorama one night — I was keen to return and my parents and I spent the afternoon there on our last day. There's a stretch of Tremont Street, from the junction with East Berkeley Street to Pembroke Street, that has dozens of fabulous shops and restaurants. We did some shopping first (mainly window shopping in my case, as my suitcase was full), visiting Olives and Grace (well-curated gifts and accessories), Niche ('urban garden supply'), Sault (hip menswear), Heartbreak Hill (upmarket running store) and Gifted (gifts (duh! ), especially locally made or themed). We then had a 'light brunch' at Aquitaine, a very American take on the French bistro. I had a delicious mac and cheese and 'helped' my dad with his duck hash. I also had a great gin and rosemary cocktail that made up for the previous night's peach schnapps disaster. Had I not already exceeded my doughnut intake for the year day, I'd have gone to Blackbird Doughnuts for pudding. There's plenty more to see, buy and eat in the South End, but I'll have to save it for another trip.